Appleby in Westmorland is rightly regarded as the jewel of north west towns with its wide elegant main street Boroughgate, ancient church and grand castle all looped by the River Eden. The town is the old county town of Westmorland and is set in the heart of the tranquil, unspoilt and beautiful Eden Valley which lies between the Dales to the south, the North Pennines ANOB to the north and the northern Lake District to the West. Run since 1989 by The Milsom family this most comfortable hotel in the EDen Valley, Cumbria will assure you of a warm and friendly welcome. The Tufton Arms Hotel was originally a 16th century coaching inn and is now a Grade II listed building rebuilt in Victorian times with tall ceilings that create a sense of space and elegance. A stunning backdrop which Teresa Milsom has used to display her interior design which takes its inspiration from and reflects the ambience, character and charm of the Victorian era. The newly refurbished reception and bar areas have a striking, chic, contempory feel with solid oak floors and clever use of Farrow and Ball paints. Giving the perfect space to relax and unwind with a bottle of wine or glass of local real ale. At the heart of our hotel is The Conservatory Restaurant offering A la Carte, changing specials as well as a grill menu with locally sourced meats. All complemented by a large, but very reasonably priced wine list. If you need a hotel in Cumbria for weddings, meetings or functions we also have a range of suites to accommodate you. One of the best hotels in Cumbria; The Tufton Arms offers you the perfect mix of luxury, excellent food and a warm welcome and is perfectly situated in some of Britain’s most spectacular scenery. There are a host of places to visit in the Eden Valley and many outdoor activities to enjoy. We offer fly fishing for both wild brown trout and salmon on The River Eden along with guiding and tuition and are responsible for many would be anglers having their first experiences on the river! The Eden valley is also blessed with perhaps the most spectacular natural feature in the North of England, High Cup Nick. It is a truly special walk and well worth the effort!! 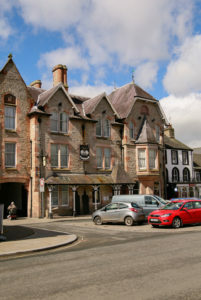 The Tufton Arms Hotel – your hotel in Appleby in Westmorland, Cumbria and the Eden Valley for that special occasion. The Tufton Arms rooms are individually furnished and decorated, offering all modern day comforts and luxury providing luxury hotel accommodation Cumbria.